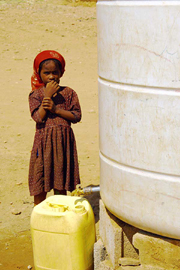 SANAA, 10 August 2010 (IRIN) – Despite record rainfall in the Yemeni capital Sanaa and other areas this summer, very little is being done to harvest this water to mitigate water shortages, experts say. In May at least seven people were killed in what officials described as the worst flooding to hit Sanaa in a decade. Flooding has brought large parts of the city to a standstill on a number of occasions. Attempts by the government to harvest rainwater are very limited, according to Ramon Scoble, a consultant for Germany’s Technical Cooperation Committee (GTZ). Sanaa is predicted to be the first capital in the world to run out of economically viable water supplies by 2017. Experts say this is due to a rapid increase in Sanaa’s population in recent years because of rural-urban migration, and the widespread planting; and inefficient irrigation of `qat’, a water-thirsty plant believed to consume 40 percent of all irrigated water. Local authorities say this increased demand for water is causing Sanaa’s water table to fall 4-6m a year. According to Salem bin Shueb, head of the Water Resources Department in Sanaa Municipality, a study carried out with the Ministry of Agriculture and Irrigation concluded that dams needed to be built to harvest rainwater to prevent water shortages. In an attempt to feed the Sanaa water basin, which is shrinking by 5 percent a year, and provide drinking water to the city, a 2008 plan entitled A Road Map to Harvesting Rainwater in Yemen was designed to ensure that 70 percent of city rainwater was harvested by 2012, and 100 percent by 2020. The plan envisaged harvesting through the building of water barriers, small dams, concrete tanks in valleys, and water harvesting systems in or on houses. Shueb explained that the government is encouraging people in areas with higher rainfall, such as Sanaa and Taiz, a city 256km south of Sanaa, to erect water collection devices on the roofs of their houses, schools and government buildings to harvest rainwater. Shueb said water shortages had been exacerbated by the widespread use of private wells and water pumps for domestic and agricultural use. Acceptability of the rainwater harvesting system to the slum dwellers of Dhaka City. Urban area like Dhaka City, in Bangladesh, has scarcity of safe drinking water which is one of the prominent basic needs for human kind. This study explored the acceptability of harvested rainwater in a densely populated city like Dhaka, using a simple and low cost technology. A total of 200 random people from four slums of water-scarce Dhaka City were surveyed to determine the dwellers’ perception on rainwater and its acceptability as a source of drinking water. The questionnaire was aimed at finding the socio-economic condition and the information on family housing, sanitation, health, existing water supply condition, knowledge about rainwater, willingness to accept rainwater as a drinking source etc. A Yield before Spillage (YBS) model was developed to know the actual rainwater availability and storage conditions which were used to justify the effective tank size. Cost-benefit analysis and feasibility analysis were performed using the survey results and the research findings. The survey result and overall study found that the low cost rainwater harvesting technique was acceptable to the slum dwellers as a potential alternative source of safe drinking water. NAIROBI – Bitter irony: in recent years Nairobi has experienced severe flooding and widespread water shortages, due to poor urban planning and collapsing infrastructure systems that are failing to support the Kenyan capital’s expanding population. Large parts of the city are not properly served by water and sanitation infrastructure, particularly crowded areas like the Eastlands estates of Umoja, Makongeni and Doholm but also wealthier enclaves such as Karen and Langata. At the same time, the rapid expansion of the city has led to sealing off of large surface areas, increasing the speed and volume of storm water run-off. Furious flooding exposes and damages water pipelines and chokes drainage channels with debris, spilling raw sewage into the streets. David Mburu, chair of the Kenya Rainwater Association, says because there is too much surface cover, rain water is prevented from percolating into the ground. Some city residents who have opted for boreholes as an alternative to the intermittent water supply are now experiencing inadequate yields. Mburu says there is a need to encourage both the harvesting of rainwater from buildings and directing run-off water into system of drains that would recharge the groundwater levels. “Not all this water should be harvested and stored since we also need to recharge our groundwater levels by encouraging use of construction material that allows for seeping of run-off water into the ground or leaving as much surface that allows infiltration of water as possible,” he says. Eleven people were killed by floods in Nairobi in 2001; while police cannot confirm the exact numbers, at least 21 more people have been drowned in flood waters since then. Otachi, whose younger brother’s body was only found on the banks of the Nairobi River four days later, is now among residents who strongly believe that the floods can be controlled and the rainwater made better use of. “It all starts with demystifying the rainwater harvesting technology,” says Mr Stephen Mutoro.”Let the people know it is within their reach to do it and its for their benefit in that they would reduce their water bills and access adequate water for non-potable use.” Mutoro is the Executive Secretary of the Kenya Water and Sanitation Network (KWSN), a water consumers’ lobby group based in Nairobi. “We need to create methods to capture rainwater as surface water is inadequate to meet demand in congested, over-paved metropolitan cities,” says Professor Shaukat Abdulrazak, executive secretary of the National Council of Science and Technology. A government statutory institute, the Council supports simple but effective rainwater harvesting methods as a solution to the over-paved city verandahs and streets. These include the installation of gutters to capture the roof water and setting up of underground storage tanks, especially by those putting up new homes and buildings. How to get the process under way is a matter of some debate. Officials from the newly-created Nairobi Metropolitan Development (NMD) ministry, a new management structure for the greater Nairobi area, say rain water harvesting is to be enhanced to address the twin issue of flooding and water scarcity in the city of three million people, 75 percent of whom live in water-scarce slum and low income areas. “We want to enhance effective rain water harvesting under an investment framework for water and sewerage services in the proposed metropolitan area in addition to managing metropolis’s water resource management capacity,” NMD minister Mutula Kilonzo promised during the launch of the draft on the proposed metropolis by President Kibaki in January 2008. The minister said that the government would seek the enactment of a legal framework to regulate rainwater harvesting, but some stakeholders in the water sector have expressed reservations over proposals contained in the NMD’s establishing document, Nairobi Metro 2030, a 423 billion dollar blueprint on the future expansion and improvement of Nairobi city and its environs. It’s not a question of denying the need for new regulations. Some existing legislation is an impediment to the implementation of the technology. But the KWSN’s Mutoro says managing the problem of urban flooding in Kenya need not wait for a new legal framework, which experience has shown could take a long time. Instead, he urges campaigns to woo people to embrace the technology should be intensified. “The government can make recommendations on the kind of roofing that is needed for every new house coming up in the city and give owners of the existing houses specified time within which they install rain water harvesting facilities but making it mandatory may not be the best way forward,” Mutoro suggests. However, he says tax rebates on materials for setting up a rainwater harvesting system may be necessary when one considers the low income bracket water consumers. Early in 2008, President Kibaki and former finance minister Amos Kimunya promised Kenyans the National Water Harvesting and Storage Policy Bill would be passed by Parliament before the end of the year. But a crowded legislative agenda, dominated by debate and passage of crucial governance laws as recommended by two commissions appointed to investigate the bungled 2007 general election and post-election violence dragged on and by the time the legislators were breaking for their recess in December, the proposed Bill had not been tabled in Parliament. It is hoped that the new Bill would be brought to Parliament once the next session commences sometime in June. Water and Irrigation assistant minister Mwangi Kiunjuri says the soonest the Bill can be brought to Parliament is August 2009. “Parliament has proceeded on recess and the parliamentary year is over. And when we come back we will embark on budget debate, so the earliest it may come is August or thereafter,” Kiunjuri said. Until new systems are put in place, the city will be suffering unnecessarily. The United Nations Environmental Programme (UNEP) estimates that Nairobi has a potential to harvest almost ten million cubic meters of water each year, if rainwater harvesting measures were in place in all the city’s rooftops, roads, open grounds and forest-covered areas. “The rainfall contribution is more than adequate to meet the needs of the current population several times over and Kenya for example, would not be categorized as a ‘water stressed country’ if rainwater harvesting is considered,” the UNEP survey report adds. Ecologists have developed a new model to predict the impact of climate change on the dengue fever-carrying mosquito Aedes aegypti in Australia – information that could help limit its spread. According to the study, published in the new issue of the British Ecological Society’s journal Functional Ecology, climate change and evolutionary change could act together to accelerate and expand the mosquito’s range. But human behaviour – in the form of storing water to cope with climate change – is likely to have an even greater impact. “Water tanks and other water storage vessels such as modified wheelie bins are potential breeding sites for this disease-bearing mosquito. Without due caution with water storage hygiene, this indirect effect of climate change via human adaptation could dramatically re-expand the mosquito’s current range,” he says. Ae. aegypti probably arrived in Australia in the 19th century on ships carrying mosquito larvae-infested water barrels. During the late 19th century, Ae. aegypti was widespread in urban Australia, stretching as far south as Sydney and Perth. By the late 1960s, Ae. aegypti was restricted to the northern half of Queensland (where it currently resides) thanks in part to removal of old galvanised tin rainwater tanks, installation of piped water, insecticides and new power lawnmowers that helped people keep their back yards tidy. The predictions come from a new “bottom-up” model that takes into account the mosquito’s biology and its physiological limitations, such as the ability of its eggs to tolerate drying out. To construct the model, Kearney and his colleagues needed to predict the microclimates mosquitoes experience. “Like all mosquitoes, the dengue mosquito has an aquatic larval phase and it is very particular about breeding in artificial containers like water tanks, buckets and old tyres. So we developed a model of the temperature and depth of water in different containers as a function of climate. We modelled two extreme types of container – a large (3600 litre) water tank receiving rainwater from a roof catchment, and a small (20 litre) bucket only receiving rainwater from directly above. We considered each container type in high and low shade,” Kearney says. Michael Kearney et al (2009). Integrating biophysical models and evolutionary theory to predict climatic impacts on species’ ranges: the dengue mosquito Aedes aegypti in Australia, Functional Ecology, doi: 10.1111/j.1365-2435.2008.01538.x, is published online on 28 January 2009.